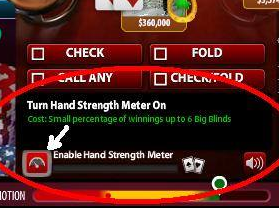 The Hand Strength Meter (HSM) is a help feature available in both Mobile and Web platforms to aid players in determining the strength of their cards in a round. 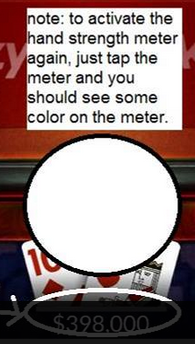 For Mobile, the meter is the vertical bar (in zPoker Classic) and horizontal bar (in Zynga Poker) next to your avatar. For web, the HSM is located under your avatar. So how do you turn ON/OFF the HSM? For Web, just click the small meter button at the left. For Mobile, just tap on the meter. How is the strength of my hand calculated? The indicated strength of the HSM is based on your on-hand cards and the community cards, only. It does not take into consideration your opponents' cards, and your opponents will not know that you are using the HSM. While the HSM gives you a strong indication of your hands effectiveness, it does not guarantee you a win. Skill and luck still matter! Only Pay When You Win! 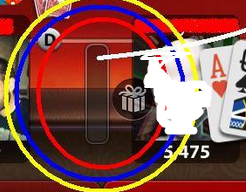 If you win a pot using the HSM, a small percentage of your winnings will be removed from your off-table chips. This amount will never be larger than one big blind. If you lose the hand, there is no charge for using the meter and no extra chips will be removed from your off-table chips! *Note: All other play will resume as normal. The HSM does not affect your on-table chips, except that you may be winning a whole lot more of them with the help of this feature!